I have been posting this series written by Maj. Sjursen on the history of the US…..he has taken us from the first inklings of nation through the revolution to the Constitution fight to 1812 and the westward movement and has brought us to this point in our history….presidency of FDR and his New Deal…. Part 1; Part 2; Part 3; Part 4; Part 5; Part 6; Part 7; Part 8; Part 9; Part 10;Part 11; Part 12; Part 13; Part 14; Part 15; Part 16; Part 17; Part 18; Part 19; Part 20; Part 21; Part 22; Part 23. A cropped version of Dorothea Lange’s iconic image of Florence Owens Thompson and some of her children, photographed at a California migrant camp in 1936. 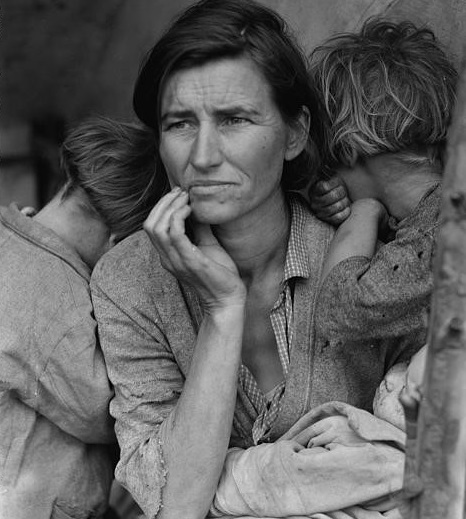 “Migrant Mother,” laden with trouble, would come to be seen as a depiction of the mood of a nation gripped by the Great Depression. See: Part 1; Part 2; Part 3; Part 4; Part 5; Part 6; Part 7; Part 8; Part 9; Part 10; Part 11; Part 12; Part 13; Part 14; Part 15; Part 16; Part 17; Part 18; Part 19; Part 20; Part 21; Part 22; Part 23. FDR was neither radical nor conservative, no matter what his defenders and critics claimed, both then and now. One part “traitor to his class” and another part defender of capitalism, he was both dangerously power hungry and the savior of American-style liberal democracy. This man was—like his party’s co-founder, Thomas Jefferson—an enigma, an unknowable sphinx. And yet he was the man for his moment. Indeed, FDR and his “New Deal,” as both a response to economic depression and reorganization of society, represent one of the most profound transitions in U.S. history. FDR served as president (1933-45) longer than anyone before or since, elected four times by wide margins. His opponents feared the man, and his supporters canonized him with rare and remarkable passion. American history is fascinating….read more to learn more. Interesting reading and good historical summary.